From left: Patrick Kane, Max Pacioretty, and Jonathan Toews all hired Darryl Belfry as their skills coach. Patrick Kane is slipperier than any player in the NHL. league. Few left wings can match Max Pacioretty’s breakaway speed with the puck. Jonathan Toews doggedly performs pretty things in unfriendly areas. For the man the three stars hire as their skills coach, the signature characteristics of their games are manifestations of a correctly executed process. And it starts with their feet. To Darryl Belfry, founder of Belfry Hockey, successful players control space on the ice when they’re moving the right way. To skate at high levels, forwards have to cross their feet. Belfry’s optimal crossover-per-step ratio is one to three. Some of his first-time clients have a one-to-nine ratio, not good enough for peak performance. It’s not an easy habit to change. The payoff, however, is worth the trouble. With their collapse against the Rangers, the Capitals failed to advance past the second round of the playoffs for the 10th straight time, a streak that started two years after their only Stanley Cup Final appearance in 1998. Washington is the runaway leader for the longest such active streak. NHL coaches and their assistants are busy people. They’re in charge of 20 to 23 high-maintenance players every day. From breakfast past dinner, they run practices, break down video, and review systems. Their windows for one-on-one player development are limited. Skills coaches such as like Belfry, however, make their living pursuing individual specificity — crossover-per-step ratios, weight transfer, uncompromised stick positioning — that an NHL coach cannot afford. In this league, there is room for both. “It’s always about the group,” Belfry said of NHL coaching. “If that means a player needs to sacrifice certain components for the good of the team, that’s the expectation. Player development is completely different. This is the era of the National Parity League. Aside from 2014-15’s tanking outliers, 25 or so teams fought on even playing fields every game. The Canadiens could have missed the playoffs if not for Carey Price. The Kings could be pushing for their third Stanley Cup in the last four years if not for their rotten late-game luck (1-7 in overtime, 2-8 in shootouts). the shootout). Goalies erase mistakes. Systems guarantee tightness. Skill separates winners from losers. Some of it is mental. The difference between a No. 1 defenseman and the third-pairing guy is often confidence. Some No. 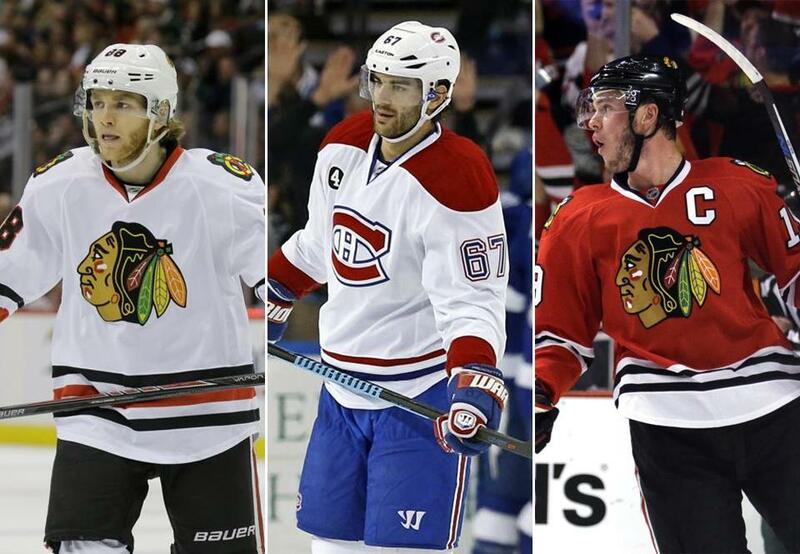 6 defensemen own the skill set to rush the puck and play creatively. But they revert to stay-at-home approaches — leaning on forwards, chipping pucks out, hammering it in after gaining center ice — because they’re scared to fail. Belfry uses Kane as an example. The clever right wing does not prefer to dump the puck into the offensive zone. Kane is confident that every time he approaches the blue line, he can carry it in and make plays instead of losing possession of the puck. Even for Kane, a 100 percent success rate is impossible. Defenders have stripped Kane of the puck and initiated counterattacks resulting in goals. The bottom-six player won’t try that play again. Failure, however, won’t discourage Kane from attacking the blue line on his next shift. Confidence requires good physical habits. It’s why players approach Belfry for counsel. They fall into two categories: the great player seeking stimulation to reach an even higher level, and the struggling player looking for relevance. A player in the second category hired Belfry several years ago. Like with all new clients, the process began with Belfry initiating a baseline profile. By watching game tape, Belfry assembled the player’s habits. He then determined the player’s identity. Then Belfry asked two questions: First, do the player’s actions align with his asset base? In other words, is the power forward doing the things asked of his position? Second, what adjustment would influence the most areas of his game? If the player’s speed can be improved, for example, would that allow him to extend puck possession or make his positioning better? In this player’s case, Belfry targeted his skating in the neutral zone. Belfry identified that the player was averaging 12 to 14 strides between the blue lines — too many for his liking. Once the player reached his destination, he was too tired to do good things. Belfry instructed the player to add a linear crossover to his neutral-zone skating. He eliminated half of his strides. The player felt stronger, faster, and fresher. It manifested downstream. Belfry, originally from Ridgeway, Ontario, maxed out in Junior C hockey as a goalie. He has since settled in Fort Myers, Fla. In nearby Estero, Belfry has held late-summer camps for his NHL clients. Previous visitors include Sidney Crosby, John Tavares, and Matt Duchene. Great players are always looking for an edge. Not everybody follows this approach. The game is shifting. The best players aren’t the biggest and strongest mashers. They’re the fastest, quickest, smartest, and most confident players. They’re off on a two-on-one before a defense settles into its structure. Skill matters. So do the coaches who help bring it out. In less than four months in 2011, Anton Stralman pulled off a difficult maneuver: two teams considered him unfit to play when his price would not have been high. On June 28, Columbus declined to make a qualifying offer to to qualify the restricted free agent. The defenseman was coming off a season in which he scored one goal and 17 assists in 51 games while averaging 19:44 of ice time. per appearance. Stralman, who was earning $1.95 million annually, according to www.spotrac.com, was free to sign anywhere. The offers didn’t exactly pour in. On Sept. 12, Stralman attended New Jersey’s camp on a tryout basis. On Oct. 5, the Devils told Stralman to hit the bricks. A month later, Stralman signed a one-year contract with the Rangers. You might say that Stralman’s services are in higher demand now. The 28-year-old has developed into a do-it-all No. 2 defenseman in Tampa behind Victor Hedman. The 5-foot-11-inch, 190-pound Swede is neither big nor fast. But Stralman, currently in the first season of a five-year, $22.5 million contract, does everything a team would ask of a top-pairing defenseman. Through two rounds of the playoffs, Stralman had scored one goal and four assists while averaging 22:22 of ice time, per game, just off Hedman’s pace (22:55). Stralman He was a positive possession player against Detroit and Montreal. In the regular season, Stralman played in all 82 games, the only Tampa defenseman to do so. He scored nine goals and 30 assists in 21:56 of action per game. The Lightning had the puck more than they chased it when Stralman was on the ice. For what Stralman lacks in size and strength, he makes up for it with technique. He is elite positionally, with both his body and stick. His hockey IQ is through the roof. Columbus and New Jersey aren’t the only franchises learning this the hard way. The Maple Leafs, who picked Stralman in the seventh round in 2005, traded the defenseman to Calgary in a deal that brought back ex-Bruin Wayne Primeau. Just two months later, before he even pulled on a Calgary jersey, Stralman was traded to Columbus for a 2010 third-round pick. The Rangers employed Stralman for three seasons, but couldn’t meet his price when he reached UFA status last summer. The Lightning were delighted to bring Stralman aboard. In Stralman’s first stops, he didn’t fit into a neat category. He wasn’t a physical stay-at-homer. He wasn’t a pace pusher. Now he does just everything right. Some players just get it later than others. 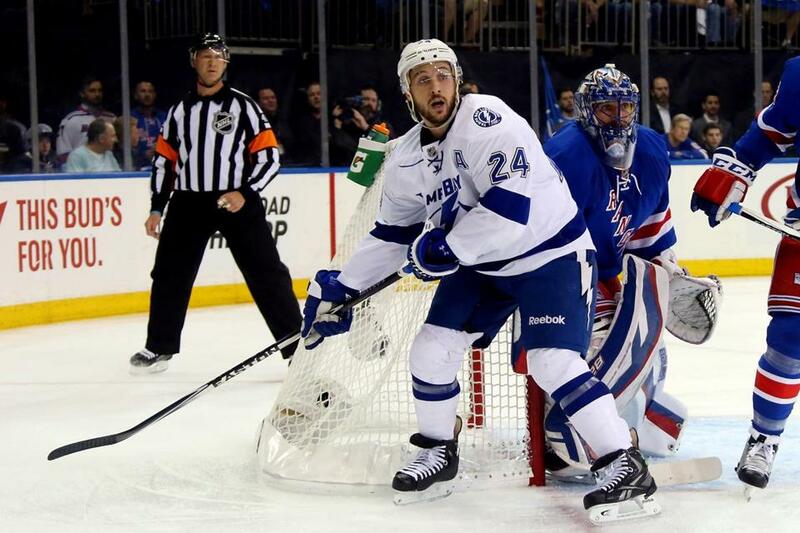 Ryan Callahan looked for the puck in front of Henrik Lundqvist in Game 1 of the Eastern Conference finals. Ryan Callahan underwent an appendectomy on Monday, preventing the right wing from dressing for Tampa Bay’s 4-1 series-clinching Game 6 win over Montreal. The right wing practiced on Thursday and suited up for Game 1 of the Eastern Conference finals Saturday. Callahan was a reliable offensive player in the regular season. In 77 games, he Callahan scored 24 goals and 30 assists while playing his usual abrasive style. But through two rounds, it’s been a postseason to forget for the former Rangers captain. Callahan didn’t score a single goal in 12 games and logged only three assists while averaging 18:17 of ice time. per outing. The right wing He was a significant factor in the first line’s struggles against Detroit. Partly because of Callahan’s quiet offensive stretch, Tampa coach Jon Cooper had to lean on his second line of Ondrej Palat, Tyler Johnson, and Nikita Kucherov. With Callahan unavailable for Game 6 following his procedure, Cooper could have slotted Jonathan Drouin into the right wing’s spot on the first line. Instead, Cooper shifted Steven Stamkos to right wing and promoted Valtteri Filppula to first-line duty. The move worked perfectly. Stamkos submitted his best performance of the playoffs. In 19:33 of play, Stamkos scored one goal, landed four shots on net, and was his usual lethal presence in the offensive zone. Stamkos, who went the entire first round without scoring a goal, regularly entered his usual office — down low on the left side — to create scoring chances. Stamkos scored his goal by whipping a slingshot from the slot past Canadiens goalie Carey Price. Cooper moved Stamkos to wing because of his trust in the do-it-all Filppula, usually the No. 3 center. Filppula played 20:24 in Game 6, second-most among team forwards behind linemate Alex Killorn (21:28). As of Friday, Rangers assistant general manager GM Jeff Gorton had not been granted permission to interview with the Bruins. Gorton’s status is unlikely to change as the Rangers continue their postseason run. It’s no secret that Gorton executes all the Rangers’ heavy lifting, leaving Glen Sather as GM in title only. Most recently, Gorton was involved in the Rangers’ pursuit of Boston University goalie Matt O’Connor, who signed with Ottawa instead. Sather does not want to let such an important asset walk to receive only a draft pick for compensation. The Rangers’ succession plan appears to be clear, with Gorton replacing Sather. However, the 71-year-old has not given any indications that his retirement is imminent. Gorton is in a tough spot. Last August, the Bruins were among the bidders for Dorchester’s Kevin Hayes once the former Chicago draft pick decided not to sign with the Blackhawks. In retrospect, signing Hayes — his uncle is Scott Fitzgerald, the Bruins’ assistant director of amateur scouting — would have been a major score. The first-year pro scored 17 goals and 28 assists for the Rangers during the regular season. The former Boston College star hasn’t shrunk in the playoffs. Hayes scored the tying goal on the power play in Game 7 against Washington. He’s been especially good when controlling the puck in the offensive zone. The 6-5, 225-pound Hayes is excellent at using his frame and reach to keep the puck away from defenders. His puck protection plus his skill made him a dangerous offensive player. The 23-year-old gives the Rangers long-term options. He could be the No. 3 center behind Derek Stepan and Derrick Brassard. Or Hayes could play wing in the top six and let Martin St. Louis walk. The following goalies who saw NHL playing time this past season could be out of the league in 2015-16: Viktor Fasth, Ray Emery, Jonas Gustavsson, Dan Ellis, Jason LaBarbera, Curtis McElhinney, Rob Zepp, Scott Clemmensen, and John Curry. All of these goalies will be unrestricted on July 1. The market has become so saturated that veteran goalies without job security are at risk of premature career irrelevance. The position is so competitive that Group 6 free agent Niklas Svedberg, still only 25, believed a one-year deal with Salavat Yulaev of the KHL was more secure than waiting by his phone after July 1 in anticipation of an NHL call not to his liking. The competitiveness of the market indicates that goaltending will continue to improve next year. Teams have more young goalies under contract in their systems to play No. 2 roles. Joel Ward had an excellent postseason. Washington’s burly right wing scored three goals and six assists in 14 games while averaging 19:02 of ice time. outing. He played alongside Alex Ovechkin early, then shifted to a lower role when coach Barry Trotz sought better balance throughout the lineup. Through two rounds, Ward was the league leader in his team’s shot attempts taken minus allowed (plus-73) when he was on the ice. Ward was a regular threat around the net, where defenders had a hard time moving his 6-1, 226-pound frame. In normal circumstances, Ward, who will be unrestricted on July 1, would be hitting the market at the right time. But he has two things that are not in his factor: his age (34) and the expected stagnancy in the cap. Last summer, Benoit Pouliot set the market for third-line UFAs. The ex-Bruin signed a five-year, $20 million contract with Edmonton. But Pouliot was 27. Ward’s ceiling is likely to be a three-year, $12 million deal. But even three years is a risky signing for a player of Ward’s age and job description. After missing out on free agent recruit Matt O’Connor, the Oilers signed Finnish goalie Eetu Laurikainen on Tuesday to a two-year entry-level contract. Laurikainen went 17-10-9 with a 2.10 goals-against average and a .933 save percentage for Espoo of Finland’s SM-Liiga. Laurikainen played junior hockey in Swift Current. The 22-year-old should start in Bakersfield, Edmonton’s new AHL affiliate . . . The Senators have O’Connor, Craig Anderson, and Robin Lehner under contract for next season. year. They also have until July 1 to negotiate with Andrew Hammond before he becomes unrestricted. Ottawa could land assets by trading Anderson or Lehner. But the Senators wouldn’t improve their team by doing so. O’Connor will need AHL time. Hammond never had professional success before this season . . . Tom Brady’s suspension showed how the NHL is way ahead of the NFL in the discipline process. First, the NFL did not release a video explaining the decision (“As the video shows, Jim McNally entered the officials’ room . . . ”). Second, the Department of Player Safety knows better than to address preachy and sanctimonious letters to the suspended players. Even Matt Cooke doesn’t need to be lectured. Fluto Shinzawa can be reached at fshinzawa@globe.com. Follow him on Twitter @GlobeFluto. Material from interviews, wire services, other beat writers, and league and team sources was used in this report.